Maiasaura peeblesorum means ‘good mother dinosaur’, and they were named well (Hamilton 2010). 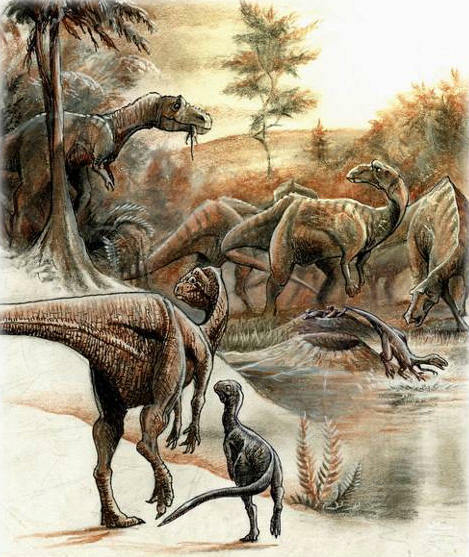 They lived in herds and raised their young; one of the few dinosaur species to do this. Although once rare, today many organisms are known to travel in large groups. A modern day example would be dolphins, which travel in pods. One nest held 30-40 eggs, and was made of mounded dirt. The parents guarded the nests, which were built about 30 feet apart from one another. One nesting site in modern day Montana, called ‘the egg mountain’, is over two acres in area (Weishampel 2004). Maiasaura peeblesorum were herbivores, meaning they ate plants. They had hundreds of teeth.Their teeth (Erickson et al. 2012) and jaw motions (Rybczynski et al. 2008, Bell et al. 2009) were better for grinding food than in big herbivorous mammals. It is thought that full-sized Maiasaura peeblesorum would have needed to eat about 200 pounds of food every day (Hamilton 2010). Their diet most likely consisted of a combination of leaves, seeds, and berries (Cole 1996). A modern day herbivore that walks the Zambian Desert in Africa is the Giraffe. The plant life during the time of Maiasaura peeblesorum was very different from plant life today. Flowering plants had only just begun to exist. The dominant foliage consisted of ferns; huge compared to the ferns we know today. Maiasaura peeblesorum had few ways of protecting itself from predators, except to travel in large herds. Although adults walked on four legs, they could run for short periods on two legs, which was faster, as another way to excape predators. An organism today that also runs fast to escape predators is the Okapia. Maiasaura peeblesorum also had hoof-like feet, which aided them in swift running (Weishampel 2004). Albertosaurus and Troodon were Maiasaura peeblesorum’s most likely predators. Ankylosaurus, and Dryptosaurus lived at the same time as Maiasaura peeblesorum, and Parasaurolophus and Corythosaurus were some duck billed dinosaurs related to Maiasaura peeblesorum and lived at the same time (Hamilton 2010). The only weapon Maiasaura peeblesorum had against predators was its thick, muscular tail that could be used to defend itself. Maiasaura peeblesorum had about average intelligence among dinosaurs. No dinosaurs, including Maiasaura peeblesorum, ever lived at the same time as humans (Cole 1996). To find out about where Maiasaura lived visit the habitat page.